Eldoret, Kenya, December 2012. Length is about 6 mm. It was found on the lower leaf surface of Brassica oleraceae in a vegetable garden. A small aphid can be seen in the upper right corner. These delicate and harmless insects are very much the ally of subsistence farmers in Kenya. It is the immature stage that provides services by feeding on aphids and other soft-bodied insects that damage crops. Before a farmer decides to spray poison into the environment and onto her food she should examine the area near the problem insects and see if there are these or other predatory insects. Most of the time they will be present and will soon be able to control the pest so long as they are not poisoned first. Fewer pesticides means more songbirds and butterflies and healthier foods at lower cost. 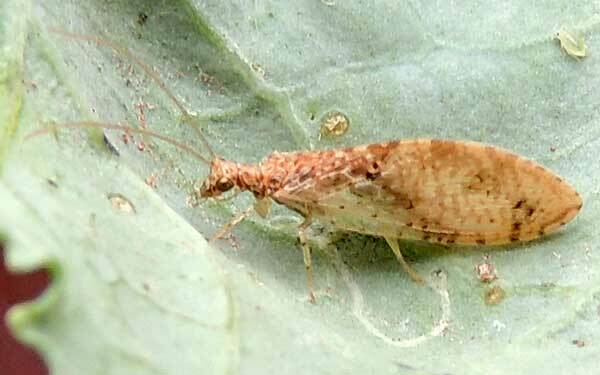 Hemerobiidae is a family of Neuropteran insects commonly known as brown lacewings. These insects differ from the somewhat similar Chrysopidae (green lacewings) not only by the usual coloring but by the wing venation: hemerobiids having numerous long veins lacking in chrysopids. Some of the costal cross veins are forked, unlike in green lacewings. Imagines of subfamily Drepanepteryginae mimic dead leaves. Hemerobiid larvae are usually less hairy than chrysopid larvae. Hemerobiids, like chrysopids, are predatory, especially on aphids, both as larvae and adults.